So long, mystery meat. Hello, spinach wraps. Starting this fall, New York City public school lunches are going meat-free one day a week, the mayor’s office announced. The city’s schools are expanding a pilot program that saw 15 schools in Brooklyn (natch) adopt “Meatless Mondays” last spring. The initiative was so well received that it is now being rolled out across the five boroughs. Once a week, the city will provide all-vegetarian breakfast and lunch offerings to its students. 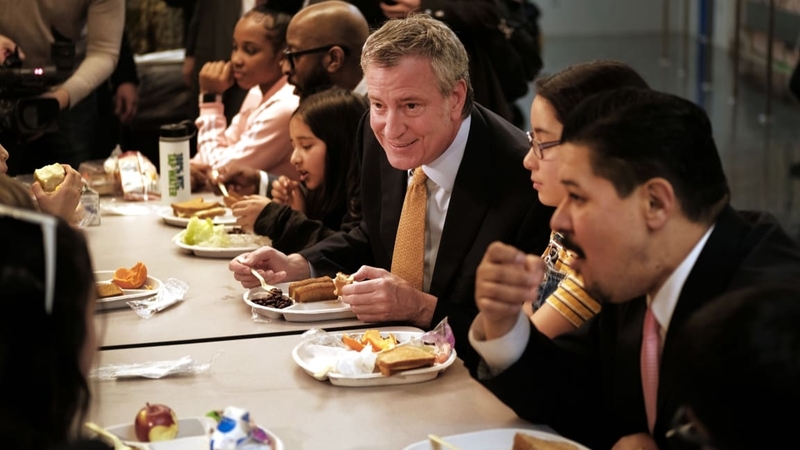 While breakfast and lunch is free for all New York City public school students, Mayor Bill de Blasio said pro-meat parents can send their children to school with a lunch that contains meat if they are so inclined. According to the the mayor, the program is not only good for students’ health, but a boon to the environment. “Cutting back on meat a little will improve New Yorkers’ health and reduce greenhouse gas emissions,” reads a statement. City officials also said the program will be cost-neutral and have no effect on the city’s bottom line. Teaching kids that cutting meat consumption is not all that hard to stomach is an easy step toward doing something good for the planet. Large-scale meat production accounts for around 14.5% of global greenhouse gas emissions, and there is a real connection between meat consumption and climate change. Plus, previous studies have shown that lacto-vegetarian diets can feed the most people on an ever-more-crowded planet, so teaching kids while they are young about how their diet impacts the planet as a whole is an important lesson, and isn’t that what school is all about? In short, it’s a win for the planet and the city and for any kid willing to forgo mystery meat.